View of opposite side of pot showing P.404 and handle decoration. An egg shape coffee pot and cover, unmarked, bat printed in black with print numbers P.414-2 and P.404 on the pot and P.419 and P.420 on the lid from the Animals Series. Additional magenta enamel band decoration. Print reference Drakard, David and Holdway, Paul. 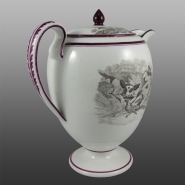 Spode Transfer Printed Ware, 1784-1833. Woodbridge, Suffolk, Antique Collector's Club, Inc., 2002.